To me, taking your dog places with you in the car is such a “normal” thing to do. In the past, I loved having my beagle riding shotgun with me as I would run errands or visit family and friends (I now know “shotgun” was not the safest place for her to be in the car…live and learn). Every time we stopped, someone was always peering through the window, oohing or aahing at how cute she looked sitting up there like she belonged. Years later, I rescued an adult dog. I naturally picked her up and plopped her in the passenger seat. She was fine before the car started, but when the vibration of the motor began, she was not at all comfortable. She wouldn’t relax and insisted on standing, or should I say “wobbling”, which made it difficult to keep her from falling at starts and stops. Eventually she got used to the car and would lay down. Thank goodness she did this on her own, because it can be complicated to train a dog to ride comfortably and obediently in a car. If you have an adult dog, maybe a new adoptee, it may take a while to train them to ride in a car comfortably if they have never done it before. It can be very strange and unpleasant for them. We don’t know what kind of bad experience they may have had in the past. With time and patience, you can work through these issues. Our Trainers are here to help you. If you are fortunate enough to begin your dog’s car riding experience as a young puppy, you are halfway there. You can control every aspect of your puppy’s experience to ensure a happy outcome. Your first step is getting your dog in and out of the car. If you have a small dog, that’s pretty easy to do! Just pick them up, place them in the back seat of the parked car (motor off), and then praise them like they have really done something. Chances are, your dog will wag his tail and excitedly check out the new digs. If they are happy, toss them a treat as a reward. Give them a few minutes to explore and sniff the inside of the car. Do this several times over a few days. Once they are comfortable being in the car, start the motor. Calm, happy talk will help to reassure them. Praise them for their bravery. After a minute or so, turn the car off and get them out. Repeat this process over the next couple of days until your dog seems to be enjoying themselves. That’s it! You have cleared the first hurdle of teaching your dog to ride in the car! If your dog shows signs of stress at any point, stop, wait a couple of days, and then start again from the beginning. How will you know if being in a car is stressful for your dog? They will give you several signs. Shaking or shivering, drooling, yawning, panting, excessive licking, are all signs of stress. Too often I see an overly stressed dog in a car bounding from one side to the other, obviously uncomfortable, and even worse, obviously unsecured. I’m sure you’ve seen it too. Let’s say you have a larger adult dog who will not get in and out of the car by himself. Our Trainers can help you with that too. They can design a training program specifically for your needs. In this video, Schylar’s trainee, Cooper, came to Holiday Barn Pet Resorts to learn how to jump up in a car. Cooper absolutely refused to get in a car, and at 80 pounds, his owner couldn’t lift him. With Schylar’s training and encouragement, look how well he progressed over a two-week period! If you have successfully completed your dog’s slow initiation into the car, they should feel pretty good about it at this point. It’s now time to go for a ride! The next step is to take your dog on its maiden voyage. Depending on their response thus far, your first trip may be to back out of the driveway and pull back in. Done. If they are happy about it, you can gradually increase the distance. If you are retraining an adult dog, take it very slowly. Keep distances very short for the first several trips. Before taking a long trip, try to at least have worked your dog up to a good 2 hours of riding time. For many dogs, the fear of car trips is really a fear of the destination, especially for an adult dog whose car trips in the past were only to the vet for vaccinations. During these first travels, visit places that are fun, like the park maybe. This is when your dog will develop his associations, this one being that traveling in the car means fun stuff happens! As the car is in motion, you will learn whether or not your dog is going to get car sick. If they begin to look a little uneasy, maybe drop their head, begin drooling excessively, maybe even whining, they may be getting sick. Have towels on hand just in case. If they do get sick in the car, we shouldn’t reprimand them. Any type of reprimand is stressful and may set them up for getting sick from stress the next time around. Thankfully, most young puppies grow out of car sickness over time. Otherwise, a trip to the vet for car-sickness meds will certainly help your adult pup. If your dog is still experiencing resistance and distress at this point, you may need to take a few more steps to help them to relax. Calming music may help. Some people swear by the use of aromatherapy. Try adding a few drops of a relaxing scent like lavender inside the car. Create a comfortable and welcoming crate or seat restraint. Place their favorite toys inside. Reward their successes with treats. Make sure the car is nice and cool before you put them inside. A warm car is very uncomfortable for your fur-coated little one. In an earlier blog, we discussed the importance of car restraints and other preparedness points. Check it out. Your dog’s safety while traveling is of utmost importance. If you must travel with a dog who is resistant to car travel, be aware that they may try to escape when the opportunity presents itself. Make sure they are properly leashed before opening the door at any stop. 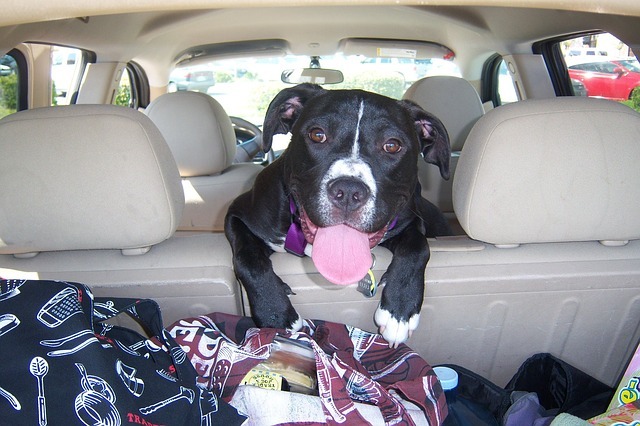 Your departure preparations can have an impact on how your dog perceives the upcoming car trip. If you are frantic or nervous while preparing to leave, your dog can pick up on those vibes. If you are organized and calm, your pup will respond likewise. Here’s a fun idea… try getting your dog excited about going somewhere. Ask them if they want to go bye-bye. Enthusiasm and happy talk before the trip nearly always works. It’s important to teach a dog to ride in the back seat, keeping your space for driving safe and free from distractions. Teach them to lay down or sit so that they do not block your vision. If your dog is not used to being crated, the idea of being in a crate while traveling may be more stressful than advantageous. Consider booster seats or other types of crash-tested car restraints that will allow your dog more freedom to move while not feeling confined. Now, go! Enjoy your trip with your best furry friend! All of your time, training, and preparation will most certainly pay off as your travel! Error: Error validating access token: Session has expired on Monday, 29-Oct-18 09:08:51 PDT. The current time is Thursday, 18-Apr-19 19:55:52 PDT.